In the picture, Yuno and Yukki are creating a world together, but what's this about? I don't know if it is an episode from the anime or from the manga. I'm still searching for it in the internet but can't find anything about it. I'm so confused. Yukiteru-2 has been deified in world #3. 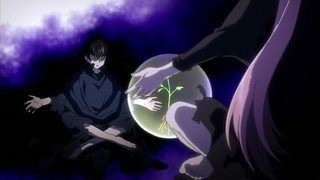 Yuno-3 is initially unaware that Yukiteru-2 exists, the whole Future Diary thing, etc., but Murmur-2 eventually transports her to Deus-3's metaphysical space where Murmur-2 is imprisoned, whereupon Murmur-2 imbues Yuno-3 with Yuno-2's memories. She then goes and finds the now-deified Yukiteru-2. The OVA ends with Yuno-3 and Yukiteru-2 meeting, but I imagine the implication is that they create a new world together afterwards, as at the end of episode 26. Er, at least, I think I have all the world numbers right, but it's been a while. The image is in the anime at the end of the 26th episode after the credits roll. That is because Yukiteru is reunited with Yuno. Not the answer you're looking for? Browse other questions tagged mirai-nikki or ask your own question. What makes the Breeder's Diary a future diary in Mirai Nikki? How come that Yukiteru won if Ninth was still alive? Why does Yuno fall for Yuki in the first place? What is the laws of cause and effect in Mirai Nikki? How do Mirai Nikki Mosaic, Paradox, and Redial relate to the main series? Is Mirai Nikki OVA equal to the manga ending? What happens if a contestant's phone turns off? What happened to the third iteration of Yuki? Is there any cannibalism in Mirai Nikki (Future Dairy)?